On Friday night, Mars was in opposition, meaning it’s about as close and as bright as it’s going to get. 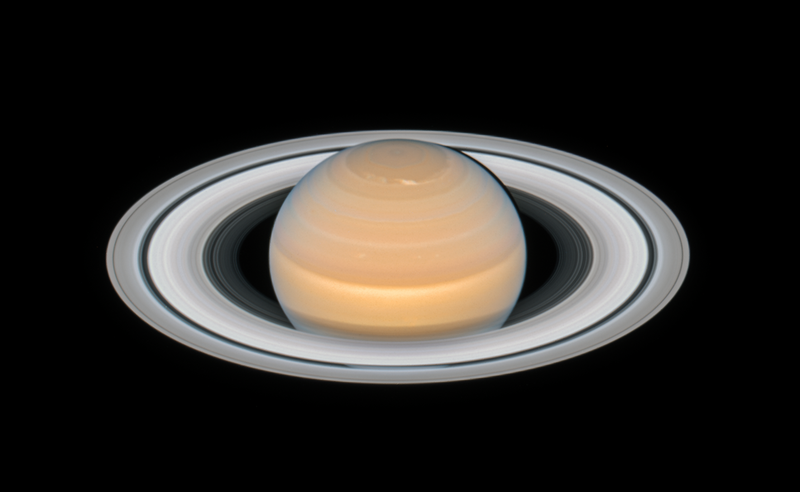 To celebrate, Hubble has released new images of the dusty red planet, as well as of Saturn, which was in opposition last month. 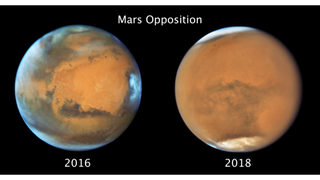 Opposition means the Sun, Earth, and Mars are lined up (and the Earth is at its closest point to the Red Planet), making Mars appear brighter than usual. Mars will be the closest it’s been in 15 years, only 35.8 million miles (57.6 million km) away, so it’s the best time to look at it through a telescope. But more importantly, you’ll be able to see the entire planet shrouded in the dust storm that currently threatening the Opportunity rover. It might sound like a bummer that the planet will look fuzzy, but it’s actually pretty amazing. There’s extreme weather happening on another planet, and amateur astronomers on Earth can actually see it. Opposition is a good time to study planets with the Hubble Space Telescope, which orbits Earth. Hubble can provide something that experiments on the Martian surface and in its orbit cannot: crisp pictures of the entire planet. Scientists can monitor the evolution of the global dust storm over time in a single image. Plus, opposition allows for slightly nicer pictures. “If you’re doing astronomy, having a bigger body allows you to obtain higher-resolution images,” said Villanueva. This new image comes after a big few months of Martian news. The Curiosity rover recently found 3.5-billion-year-old organic molecules in Mars’ Gale crater. This week, the Mars Express spacecraft announced what appeared to be an enormous standing body of salty water about a mile beneath the Martian surface. All the while, a local dust storm on the planet’s surface went global, cutting off human contact with the Opportunity rover.